During its meeting in May this year, the Standing Committee of the National Board for Wildlife cleared a proposal from the Tamil Nadu Forest Department for a new 8.6 km road through the Srivilliputtur Grizzled Squirrel Sanctuary (SGSS) ostensibly for ‘protection’ of the Sanctuary. 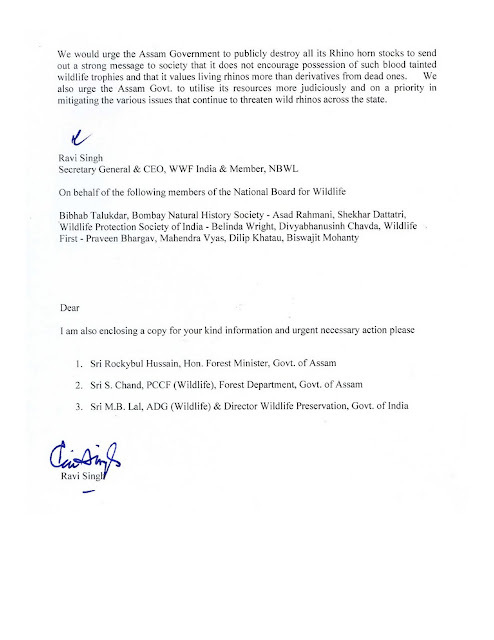 The clearance was given despite a written objection submitted to the MoEF by independent members on the Standing Committee, Dr. Divyabhanusinh Chavda, Dr. Bibhab Talukdar and Dr. Asad Rahmani. "In all the above mentioned cases, the non-official members did not approve the proposals put to the Standing Committee". "Further, neither any objection from other members whose names had been indicated in the letter of Dr. Chavada had been raised regarding the minutes nor any confirmation of the stand taken by Dr. Chavada in his letter was received from them. The Chairmain also clarified that all the decisions taken in the last meeting were unanimous and it was accordingly reflected in the circulated minutes..."
We, the undersigned, who are all members of the National Board for Wildlife (NBWL), strongly object to the way this proposal for a road through a wildlife Sanctuary in the Western Ghats – one of the most important biodiversity hotspots in the world – has been bulldozed through the Standing Committee of NBWL. A note on the ecological importance of the area and the potential negative impact of the road is appended. 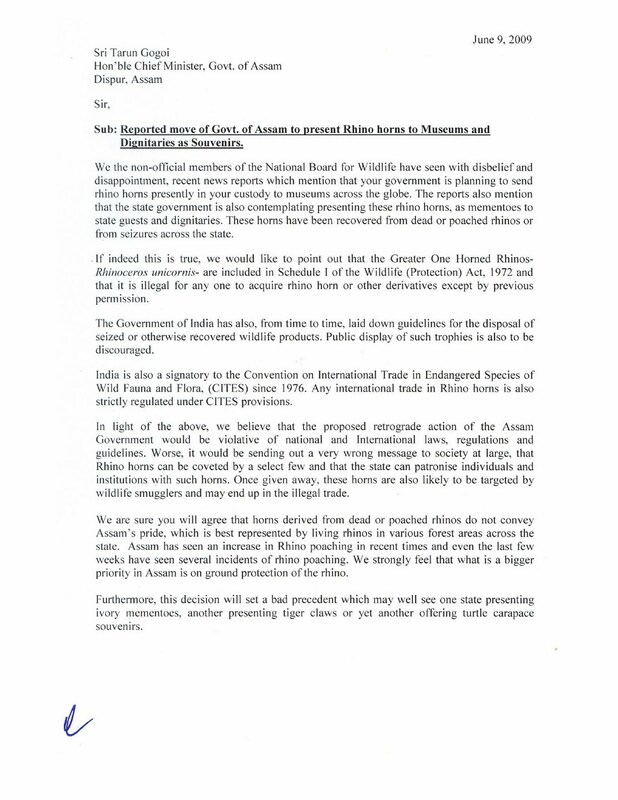 In view of the above facts, we request the CEC to reject the proposal of the Tamil Nadu Forest Department for construction of the road, and direct the Tamil Nadu Forest Department to take up appropriate measures including foot patrols and anti-poaching camps, to protect the area. The Srivilliputtur Grizzled Squirrel Sanctuary at Sirivilliputtur in southern Tamilnadu spreads over 480 sq.km. 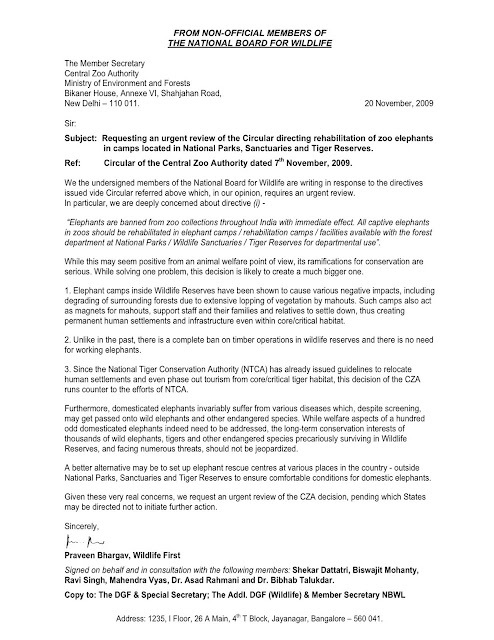 It is contiguous to Periyar Tiger Reserve (PTR) on the south western side and the Megamalai Reserve Forest on the north western side. Its southern limit is contiguous with the Sivagiri Reserved Forest of Tirunelveli Forest Division. The sanctuary lies mostly in Virudhunagar District and partly in Madurai District, nestling in the high ranges of the Western Ghats. It is the eastern watershed boundary of the Periyar River and is one of the best preserved forests south of the Palghat gap. The tributaries of the River Vaipaar and a few rivulets draining into the River Gundaar originate from the hill tracts of this sanctuary. The floral diversity is extremely rich owing to the different types of forest formations due to the altitudinal gradient and rainfall patterns (Source: Tamil Nadu Forest Department). The SGSS is one of the few wilderness areas in India fortunate enough not to have a road network. In this fragile, hilly habitat roads can only have a destructive impact, leading to erosion, habitat fragmentation, influx of humans and vehicles and incursion of pernicious weeds such as Lantana and Eupatorium. World over, roads have proven to be the worst enemies of remote forest areas. The SGSS is a treasure trove of biodiversity. Its diverse habitats are home to equally diverse species – from endangered grizzled squirrels to Schedule I/II species like tiger, elephant, Nilgiri marten and Nilgiri tahr. 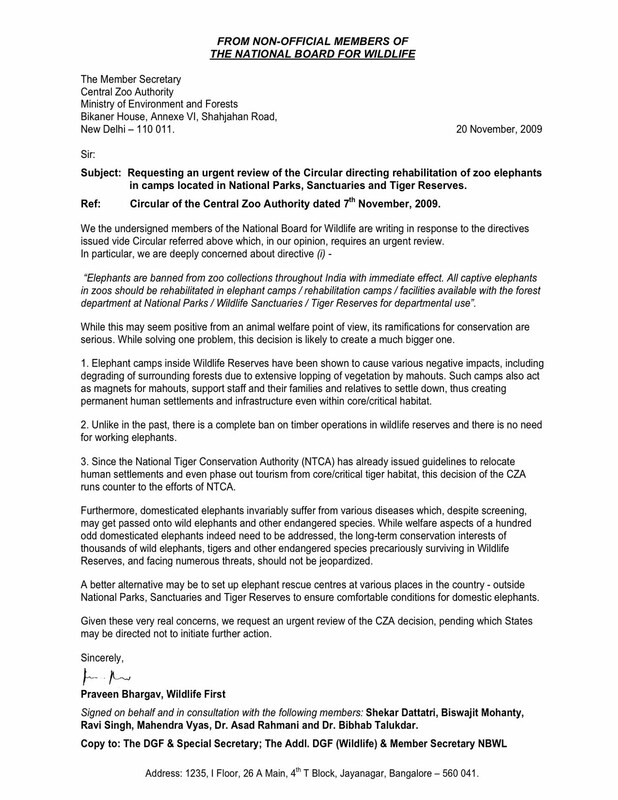 What makes this sanctuary even more critical is the fact that it is an invaluable ‘sink’ or buffer area for dispersing tigers from the PTR’s ‘source’ population. Many endemic species of Western Ghats flora and fauna find refuge in SGSS, including great pied hornbill, lion tailed macaque and Nilgiri langur. The Tamil Nadu Government has now proposed an 8.6 km road through this pristine wilderness, connecting Tuggolakilavan Koil to Kamarajapuram. The reason given for this road is that it is required for protection of the sanctuary. However, it will be abundantly clear to anyone on a site visit, or looking at a topographical map, that this road cannot help with the protection of the sanctuary in any way, and that the only purpose the road will serve will be to connect the aforementioned two points for vehicular traffic. 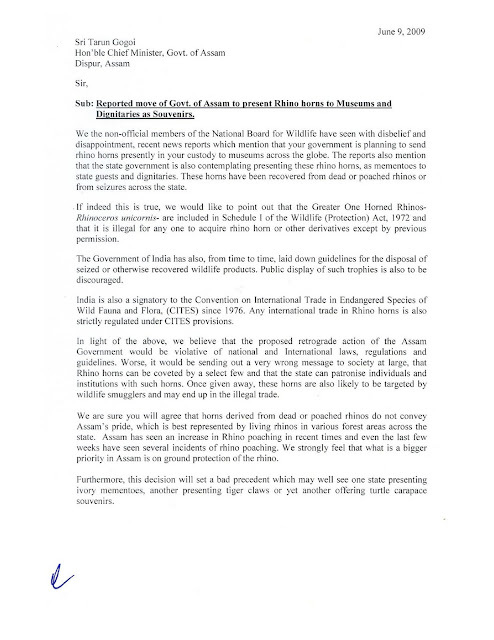 This is apparently a move to circumvent the restrictive provisions of Section 29 of the Wildlife (Protection) Act, 1972 and the orders of the Hon Supreme Court in IA 548/2000 in WP 202/1995. SGSS is an extensive, linear sanctuary and the proposed road will bisect it, fragmenting the sanctuary into two. The road will cut through one of the most crucial elephant corridors in this area and lead to elephant-human conflict by disrupting their natural migratory patterns. The proposed ghat road will also make it impossible for most animals to cross from one side of the forest to the other, severely affecting gene flows of all wildlife. We believe that there is absolutely no real justification for this road as the damage it will cause to the ecosystem and to animal movements will be massive and irreversible. As per the Forest Department, 620 trees will have to be cut in the sanctuary for the road. Being a rocky, hilly area, blasting and large-scale earth moving will be necessary. The road will only facilitate illegal activities such as poaching, timber smuggling and ganja transportation. The claim that the road is for protection of the sanctuary is untenable. On the PTR side of the same habitat, effective anti poaching is being done through foot patrols by Forest Guards, and Tamil Nadu can easily adopt a similar system. In fact, SGSS still has an extensive network of bridal paths laid by the British, which are ideal for foot patrolling. The Standing Committee of the National Board for Wildlife has cleared this proposal without due diligence, site inspection or scientific analysis of destruction to wildlife habitat, despite the written objections of its non-official members.